You’re probably looking forward to warmer weather, but before you know it, temperatures will be soaring. Fortunately, there are several ways to make your home (and you!) more comfortable, while reducing your summer energy bills. Much of the unwanted heat in your home comes through your windows. Using windows shades is a simple, effective way to help block the sun’s heat. 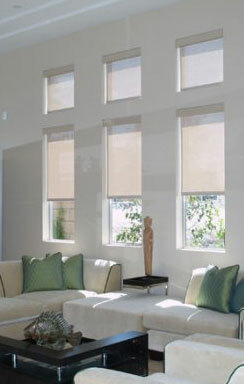 Pull shades on sunlit windows down on sunny days, and your room will be cooler and more comfortable. Solar Fabrics will still allow you to enjoy the view, while reducing glare and heat. You can even choose motorized shades to make the process of raising and lowering your shades as easy as flicking a switch. If you’re using your oven in the summer, you’re adding heat to your home. It can raise the temperature of your kitchen and nearby rooms, while making you quite uncomfortable as you cook. Instead, try microwave and crockpot meals during the summer. Or take advantage of the nice weather by cooking outside. Grilling out will give you the perfect chance to enjoy your deck, outdoor furniture, and other seasonal areas and accessories. It can be difficult to sleep if you’re too hot, so try to make your bed as cool as possible during the summer. Start by using a cooling gel pillow and a cooling mattress pad. Use high-quality cotton sheets, which breathe easier and stay cooler. You can even put your sheets in a plastic bag and stick them in the freezer for a few minutes before bed. Ceiling fans can help cool you off, but they don’t change a room’s temperature. Turn them on when someone’s in the room, and adjust the fan’s direction according to the season. During the summer, your fan should be rotating counter-clockwise. If it’s not, look for a switch on the side of the fan, and flip it to change the fan’s direction (Don't forget to turn the fan off first.) You should then be able to feel a cool breeze when standing underneath the ceiling fan. Taking a cool shower, especially before bedtime, can help you feel much cooler and more comfortable. Also try drinking an iced drink like tea or lemonade. Finally, applying a cold washcloth to your neck and wrists can lower your temperature because they contain pulse points – areas where your blood vessels are close to your skin’s surface. Summer can bring sweltering temperatures, but using these tips can help you beat the heat. You’ll stay more comfortable while also reducing your air conditioning bills.